Sock: noun – a short stocking usually reaching to the calf or just above the ankle. Through my teens and twenties I shoved my bare feet into moccasins for all but the coldest months of the year. Uninterested in, and unfazed by, social pressure to wear the latest styles, my feet were free spirits, non-conformists, the hippies of feetdom. Tiptoeing through the tulips in the most minimal of foot coverings, my feet lived in peace and happiness. Alas, even free thinkers age and one day my feet realized that the times, they were a-changin’. They were tired by day’s end and the padded insoles and arch support offered by sturdier footwear now held much appeal. But how do feet bow to the need for sensible shoes without losing their identity? How do they acquiesce to the addition of socks to their wardrobe? Socks, for Pete’s sake – restraining tubes of navy or brown boredom enclosing tootsies in darkness for hours on end. “Say it isn’t so,” moaned the feet. Trudging despondently through the department store on their first major sock shopping expedition, my feet soon made a surprising and joyful discovery: socks don’t have to be boring at all! They come in every colour and pattern imaginable. Feet can dress for holidays and display their favourite interests, hobbies and television characters all year long. There are even socks as souvenirs from favourite places. 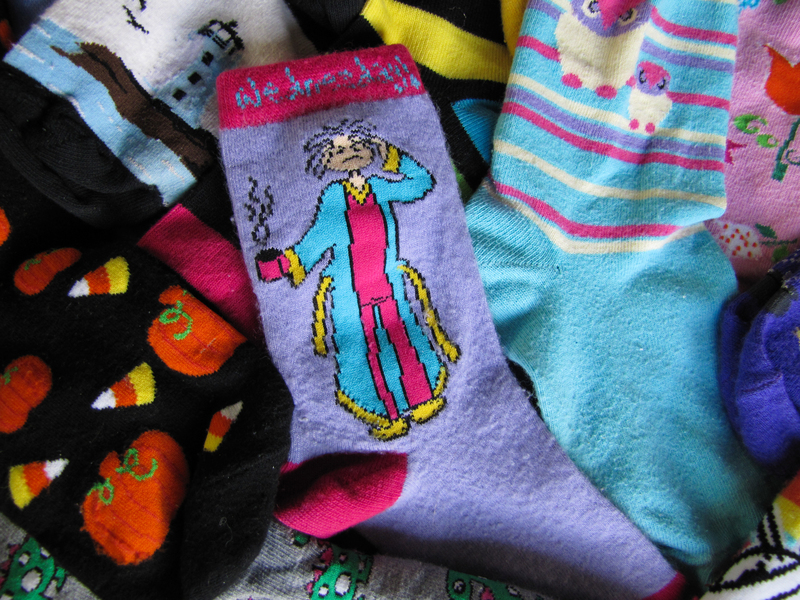 Socks are, in fact, a perfect way for feet to express their individuality. So now my feet are content to wear stodgy shoes because, still unfettered by the fickle notions of our fad-driven society, they are free to enjoy whatever socks they choose. Sometimes they flaunt the day’s pick, carefully chosen to complement an outfit or celebrate an occasion. Other days call for more subtlety and my feet hide, chuckling, under the boardroom table, rebels clad in Spongebob Squarepants, surrounded by conformists. And if my feet no longer choose to tiptoe almost naked through the tulips, they now take enjoyment from wrapping themselves in colourful flowered socks. To everything, there is a season. 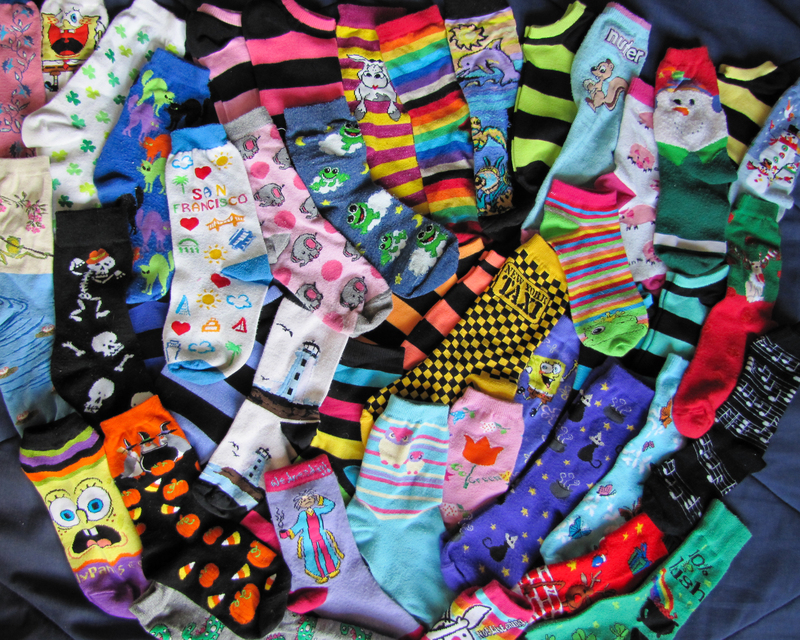 A small sampling of socks. I started wearing thinner socks this year. Now, they’re fazing out the good ones! I must check out that website. Cute post.